How to Convert DVD Movies for Sony Xperia Z or ZR? Guide on ripping DVD video or audio to playback on Sony Xperia. Want to rip DVD VOBs to backup DVD movies to PC or Mac? Prefer to enjoy movies on portable devices? If you are using Sony Xperia, have you thought of moving DVD movies to Sony Xperia so that you can enjoy your favorite movie anywhere you like? Since wide-screen smartphones are more and more popular, viewing HD movies on smartphone brings us more comfortable video watching experience. Is it possible to rip DVD movies to Sony Xperia compatible format for playback movies anytime or any where you like? The answer is yes, but to realize ripping DVD movies to Sony Xperia, you have to install a DVD ripping software first. Acting as an ideal DVD VOB to Sony Xperia Converter - Bigasoft VOB Converter makes it easy to rip and merge VOB files from DVD to a whole movie playable on Sony Xperia Z/ZR. Rip DVD, DVD folder, ISO to any HD or SD format you like, including MP4, AVI, MKV, MOV, WMV, WTV, etc. Rip DVD movie to compatible format for popular media devices, such as Sony Xperia, Samsung Galaxy, Blackberry, iPhone, iPad and other Android, Windows or iOS phones or tablets. Merge VOBs into one whole movie instead of several parts. Cut any video segments you like from DVD movie. 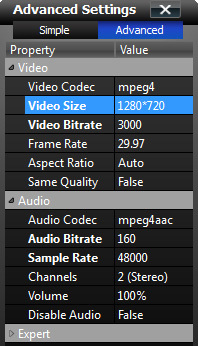 Extract movie music or audio track from DVD fast and keep high quality. Extract subtitle or add new subtitle to DVD movie. 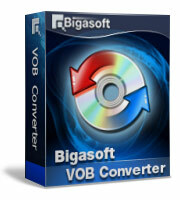 Bigasoft VOB Converter for Windows works perfect on Windows 2000, Windows XP, Windows Vista, Windows 7, Windows 8 and Windows 10. Bigasoft VOB Converter for Mac is fully compatible with Mac OS X v10.5(Leopard), 10.6(Snow Leopard), 10.7(Lion), 10.8(Mountain Lion), 10.9(Mavericks) or 10.10(Yosemite). In this article, we will take ripping DVD VOB to Sony Xperia for example. The settings apply to Sony Xperia Z1, Z2, Z3 and ZR. 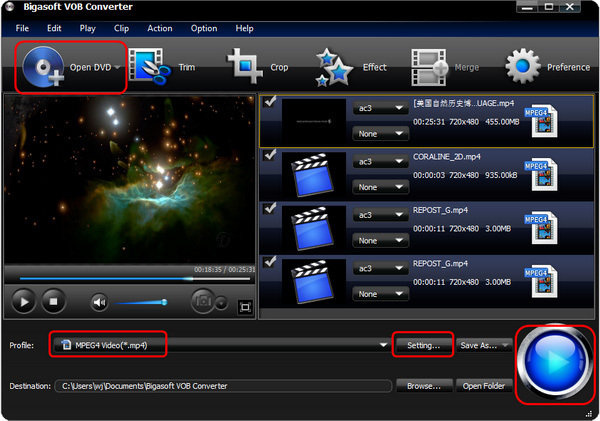 Firstly, download and install the ideal DVD to Sony Xperia Converter - Bigasoft VOB Converter.